​Delicata squash, an oblong green and yellow gourd, are often piled in large piles along with other unfamiliar squash such as hubbard, sweet dumpling and buttercup Unfortunately they are often regarded as fall decor but beneath their colorful exterior is a very uniquely flavored and textured squash with much culinary potential. As the name slightly implies the delicata squash has a very delicate flesh and tender skin. Because of this trait the delicata cooks much more quickly then all other squash. The flesh is also very delicious as it tastes even sweeter then a sweet potato. These delectable squash are harvested in the fall and can be found throughout the winter at the grocery store. The bright orange flesh signifies the high concentration of beta-carotene, a molecule that can act as an antioxidant or be converted into vitamin A. Vitamin A plays a role in the visual cycle and in new cell growth. Diets high in beta-carotene have found to reduce the risk of heart disease, cancer and neuro-degenerative diseases. This dish takes advantage of the delicatas' quick cooking time and provides a little nest for an egg. Having recipes that include ingredients that are high in nutrients yet can satisfy cravings for hearty and filling foods an effective strategy in disease prevention. ​Make sure to buy eggs from pasture raised chickens. The waste from factory farmed animals has by far is the most devastating environmental impact on our planet. This unnatural practice is responsible for a complete imbalance in the ecosystem causing deadly algae blooms,acidification of the oceans, clean water shortages, deforestation and is the lead cause of climate change. The companies that are responsible for improperly disposing of the massive amount of waste created by these monocultures are not held accountable for their destruction of the environment. The amount of cruelty forced upon these animals and workers is inexcusable. Animal protein should make up a very small portion of the diet anyway which will decrease the demand for eggs and irresponsible agriculture. I use the Minimalist Baker's recipe for vegan Parmesan to decrease animal products and increase nutrient intake. It can be made ahead of time and stored in the freezer. If you are going to include animal protein in the diet it is imperative to support responsible and sustainable agriculture through the purchases you make. 1 Tbsp vegan "Parmesan cheese"
Preheat the oven to 350 degrees. Dice the squash into small cubes with the skin on. Place in a nest shape on a square of parchment paper. Crack the egg into the center and season with the salt, pepper and paprika. Top with the Parmesan. 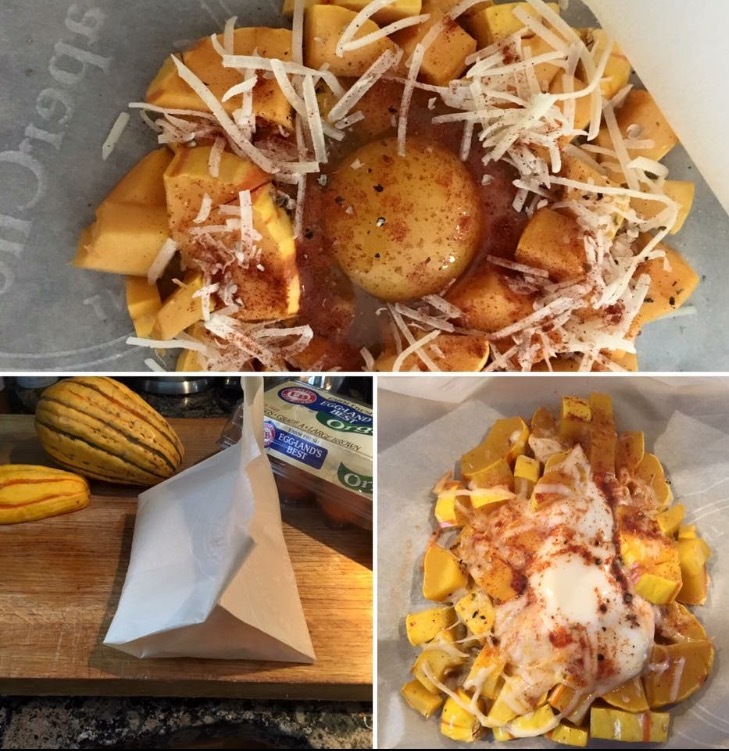 Fold the parchment paper into a pocket and staple on the ends like the picture on the left shows. Place on a baking sheet and bake for 15 minutes once the oven has reached 350 degrees.